But technology may be the solution yet again, in the form of autonomous delivery devices much smaller than Class 8 trucks. Much smaller: The vehicles may be no bigger than a large ice box or two, moving along sidewalks looking for specific humans. 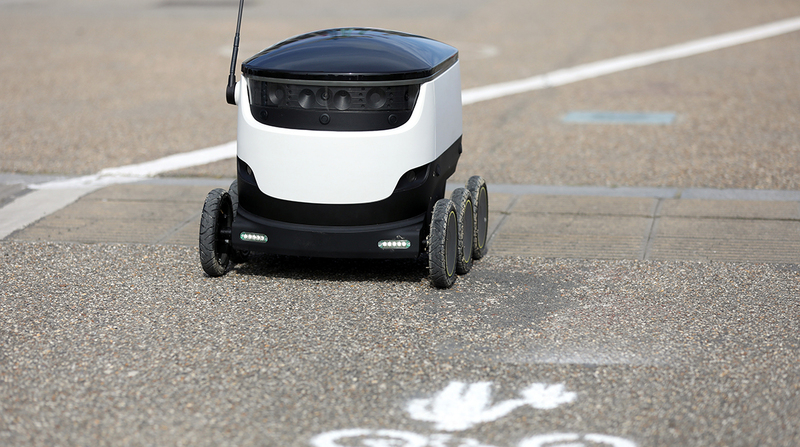 Speaking at the 98th annual meeting of the Transportation Research Board, Miguel Figliozzi spoke of what he called SADRs — sidewalk autonomous delivery robots. Figliozzi, a Portland State University professor, said the devices tend to look like “ice coolers on wheels,” but the concept is being taken seriously by tech companies. Unlike drones, the robots never leave the ground and can carry heavier items. Like drones, government regulators already have spotted them: San Francisco is already home to nine such working devices, Figliozzi said. The city mandates they keep their pace at no higher than 3 mph. In Arizona, the SADRs can go up to 10 mph, and they don’t need lights or insurance, he added. But to really be worth their price, the SADRs would have to help freight and delivery companies make numerous stops. Figliozzi told an audience of about 100 people at a TRB forum on Jan. 14 that some plans call for a “deployment” van or truck that would stop in a given area and release as many as eight devices. They would deliver their goods and come back to the van or truck. Such once-unimaginable plans are being devised by tech, freight and delivery companies to help with the problems of congestion, parking and logistics in urban areas, perhaps the most difficult areas for final-mile deliveries. At another forum devoted to discussing the curbside dilemma for delivery trucks, panelists noted the growing demands of freight and deliveries on a limited urban landscape, and devised new methods to manage through it all. The problems for the city of Washington are especially challenging for planners, as the district has only 580 public loading zones. “We have a lot to accommodate and not a whole lot of space,” said Stephanie Dock, a research manager for the District Department of Transportation. Dock told an morning audience that the district now uses real-time parking information for loading zones. The district has also incorporated online payments via cellphones and has also made available one-day passes. One eternal problem for freight unloaders and deliverers Dock noted: If you add more space on streets for freight unloading and delivery, car owners will still try to park there.